Last week I was visiting my close friend Adam who lives in Michigan City, Indiana. M.C. is located in northern Indiana, on the southern shore of Lake Michigan and it is a surprisingly expansive place for a small midwestern city, in that M.C. falls as much within the sphere of influence of big city Chicago (in Illinois) 50 miles to the west, as it does coastal Michigan, five miles northeast and beyond, in a sense giving M.C. a kind of tri-state regionalism. Add to that the bewildering time zone borders and variation among Indiana counties that opt in or opt out of Daylight Savings Time, well, it's a mildly disorienting place, but interesting, as most places are, if you spend enough time in them and look closely. The truth is that I would have never gotten to know this place if it hadn't been for the fact that I have visited my friend on several occasions, and we both like to drive around with cameras. Owing to its location on the lake, adjacent to the Indiana Dunes National Lakeshore, Michigan City is a place where one can frequently see thunderstorms rolling in off the lake, well before they hit the city. We were on our way to have a pizza on Wednesday evening as a powerful thunderstorm was close to making landfall. Since I brought my camera along, Adam, who is also a photographer, suggested that first we go to the lakefront to see the incoming storm, and try to capture images of the lighting strikes. After several failed attempts, and also my dissatisfaction with the framing I was able to achieve without a tripod (trying to improvise with picnic tables, garbage cans etc. 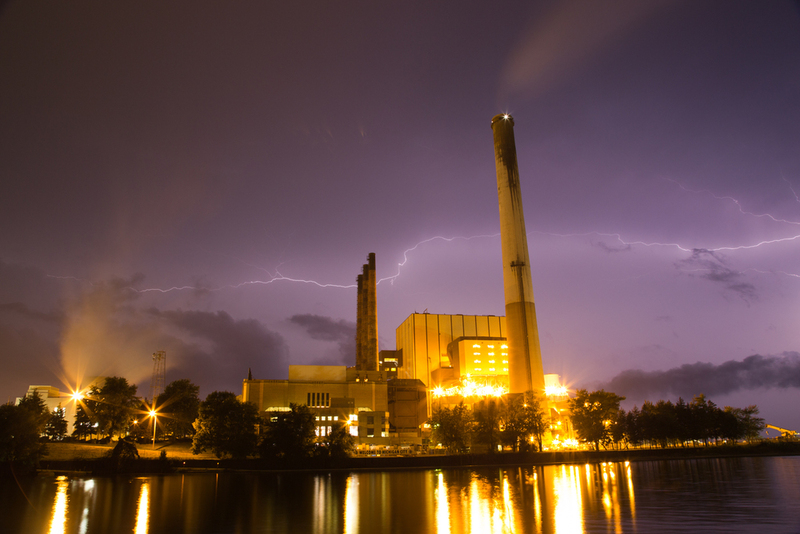 ), he suggested we drive over to the power plant to try to get a shot with the plant and lightning. Dramatic lighting was striking every 30 seconds or so, so the chances were good that I'd be able to get something, if I could get the settings on my camera right, and be a little lucky. After experimenting with my exposure, the scene was beginning to look pretty good. Adam has much more skill than I do in the digital realm, so with his advice, I settled on ISO 100, f11 with a 30 second exposure. There was a canal between our position and the plant so I placed my camera on the ground at the edge of the embankment and used the lens cap for a slight upward tilt. After a few cycles of 30 second exposures, I started to get what I was looking for. Finally, on what was probably the 10th or 11th attempt, a spectacular display of electricity bolted in every direction, directly behind the power plant, and fortunately, I captured it. We were both excited to see the result. Once we looked at the image on the camera's LCD display, we both agreed "got it" and "time to get out of here". Moments later the sky opened up and torrential rain poured down on M.C. Many thanks to Adam for helping me achieve this awesome result.